"Bradd Wong" redirects here. For the video game character, see Brad Wong. Bradley Darryl Wong (born October 24, 1960) is an American actor. Wong won a Tony Award for his performance as Song Liling in M. Butterfly, becoming the only actor in Broadway history to receive the Tony Award, Drama Desk Award, Outer Critics Circle Award, Clarence Derwent Award, and Theatre World Award for the same role. He has since gained more notability for playing the roles Dr. George Huang on Law & Order: Special Victims Unit, Father Ray Mukada on Oz, Dr. John Lee on Awake, Dr. Henry Wu in the Jurassic Park franchise, and Ngapoi Ngawang Jigme in the film Seven Years in Tibet. As of August 13, 2017, Wong is the host of the new HLN medical documentary series Something's Killing Me with BD Wong. As of the Season 3 premiere of USA Network's program Mr. Robot, Wong has been upgraded to a series regular. He was nominated for a Critic's Choice Television Award for his role as Whiterose in Mr. Robot, also earning an Emmy nomination for Outstanding Guest Actor in a Drama Series. Wong has also done extensive voiceover work and stage acting. The most well known of his voice acting roles is that of Captain Li Shang from the Disney animated film Mulan. He would later reprise this role twice, most notably for the video game Kingdom Hearts II. Beginning in 2016, Wong appeared in the TV series Gotham as Hugo Strange. Wong was born and raised in San Francisco, California, the son of Roberta Christine Wong (née Leong), a telephone company supervisor, and William D. Wong, a postal worker. He has one older brother and one younger brother. He is of Chinese descent, with family from Hong Kong. Wong attended Lincoln High School, where he discovered his love of acting and starred as the lead in numerous school plays, before attending San Francisco State University. Wong gained wide attention as a result of his Broadway debut in M. Butterfly opposite John Lithgow. The play won multiple awards, including several for Wong, who at that time ceased using his full name in favor of his initials. He has since ceased the use of punctuation in his initials. He is notable as the only actor to be honored with the Tony Award, Drama Desk Award, Outer Critics Circle Award, Clarence Derwent Award, and Theatre World Award for the same role. In addition to his long-running stint on Law & Order: Special Victims Unit as FBI psychiatrist Dr. George Huang, he has had recurring roles in All American Girl and as Father Mukada on all six seasons of Oz, with guest appearances on The X-Files and Sesame Street. On the big screen, he has appeared in The Freshman (1990), the 1991 remake of Father of the Bride and its 1995 sequel, Father of the Bride Part II, Jurassic Park (1993), Executive Decision (1996) and Slappy and the Stinkers (1997). He also provided the voice of Captain Shang in Disney's Mulan (1998), its direct-to-video sequel, and the video game Kingdom Hearts II. He returned to Broadway as Linus in a revival of You're a Good Man Charlie Brown, alongside Anthony Rapp, Roger Bart and Kristin Chenoweth, and the 2004 revival of Stephen Sondheim's Pacific Overtures. In 1990, Wong objected to Actor’s Equity that the plan to use British actor Jonathan Pryce in the role of The Engineer in Broadway run of Miss Saigon, which Pryce had originated during the show’s extended run in London, would take jobs away from actors of Asian descent. Although the union barred Pryce from acting the role in response to Wong’s complaint, vociferous opposition from Charlton Heston and a threat by the musical’s creator and producer, Cameron Mackintosh, to cancel the American production entirely, induced the union to reverse course. Pryce went on to win a Tony award for Best Actor in a Musical for that role. In 2008, he starred in the one-man show Herringbone, in which he portrayed 12 roles, at McCarter Theatre at Princeton University. He brought the show to the La Jolla Playhouse in San Diego the following year. In 2012, Wong starred in Herringbone to benefit Dixon Place in New York for two performances. The production, recorded live for a 2014 CD release, was his first appearance in New York of the material, timed to coincide with the 30th anniversary of the original New York production. In 2014, Wong starred in the U.S. premiere of James Fenton’s acclaimed adaptation of The Orphan of Zhao, a classic Chinese legend that has its roots in the fourth century BC, directed by Carey Perloff at American Conservatory Theater (A.C.T.). The Orphan of Zhao is an epic story of self-sacrifice and revenge. In the aftermath of a political coup, a country doctor is forced to sacrifice his own son in order to save the last heir of a noble and massacred clan. The Orphan of Zhao was a co-production with La Jolla Playhouse. Wong announced his departure from the cast of Law & Order: SVU in July 2011, to join another NBC police drama, Awake, in which he portrayed Dr. Johnathan Lee, a confrontational therapist of an LAPD detective (portrayed by Jason Isaacs) who lived in two realities. Wong guest starred in a thirteenth season episode of Law & Order: SVU titled "Father Dearest" (which aired May 2, 2012). In 2015, he was named Artist-in-Residence at La Jolla Playhouse. Wong guest starred on a NCIS: New Orleans Episode 1.13 titled "The Walking Dead" (which aired February 3, 2015), where he portrayed Navy Lieutenant Commander Dr. Gabriel Lin. Wong also guest-starred as the enigmatic Whiterose (who is head of The Dark Army) in Season 1's episodes 8 and 10 on USA Network's Mr. Robot. He also plays the dual role of Zhang, the Chinese Minister of State Security. He returned in recurring roles for the show's second season, but has been promoted to the main cast for the third season, which debuted October 11, 2017. Beginning August 13, 2017, BD began hosting the new HLN series Something's Killing Me With BD Wong. The documentary explores strange and unexplainable, real medical ailments and attacks that may be gradual or descend rapidly. But in either case, if a cause and cure aren't found immediately, these real-life patients will die. Wong donates his time and resources to a number of LGBT and arts-related charities, such as the Ali Forney Center, Materials for the Arts, and Rosie's Theater Kids. Wong is openly gay. He began a long-term relationship with talent agent Richie Jackson in 1988. In 2000, the couple had twin sons—Boaz Dov, who died 90 minutes after birth, and Jackson Foo Wong—through a surrogate mother, using Wong's sperm and an egg donated by Jackson's sister. In 2003, Wong wrote a memoir about his experiences with surrogacy titled Following Foo: the Electronic Adventures of the Chestnut Man. Wong and Jackson ended their relationship in 2004. Wong amicably co-parents his son with his ex-partner Jackson and Jackson's partner, Jordan Roth. On October 7, 2018, he married Richert John Frederickson Schnorr, his partner of eight years, in Brooklyn, New York. 1986 Simon & Simon Counterboy – Photo Shop Clerk Episode: "Mobile Home of the Brave"
Aladdin/The Genie Episodes: "Little Red Riding Hood" and "Aladdin"
2015 NCIS: New Orleans Navy Lieutenant Commander Dr. Gabriel Lin Episode: "The Walking Dead"
2015–Present Madam Secretary Brent Rosen Episode: "The Kill List", "Refuge"
2015 Nurse Jackie Doctor Wu Episode: "Are You with Me, Doctor Wu?" 2016 Last Week Tonight with John Oliver Scientist Episode: "Scientific Studies"
Episode: "The House of the Lucky Gander!" ^ "BD Wong returns to his hometown for Orphan of Zhao". sfgate. 2014. Retrieved July 19, 2014. ^ The Grand Rapids Press. "'Law and Order' actor BD Wong to speak at Fountain Street Church". MLive.com. Retrieved March 15, 2012. ^ "53rd Drama Desk Awards". Drama Desk. 2008. Archived from the original on July 4, 2008. Retrieved May 19, 2008. ^ "Theatre World Awards Recipients". Theatre World. 2008. Archived from the original on May 16, 2008. Retrieved May 19, 2008. ^ Mitovich, Matt (July 17, 2011). "Fall TV Scoop: B.D. Wong Reveals His SVU Fate". TVLine. Mail.com Media. Retrieved July 17, 2011. ^ "(#1321) "FATHER DEAREST"". The Futon Critic. April 20, 2012. Retrieved April 21, 2012. ^ Adam Hetrick (October 29, 2009). "Wong Joins Adams, Burgess, Pazakis and More for A Very MARY Holiday". Playbill.com. Archived from the original on March 23, 2014. Retrieved November 1, 2012. ^ a b Christopher Stone (November 16, 2005). "B.D. Wong: Out Author, Actor and Parent". AfterElton. Archived from the original on April 19, 2008. Retrieved May 19, 2008. ^ "BD Wong, Richert Schnorr". The New York Times. Retrieved October 7, 2018. ^ a b Chris Tilly (March 18, 2014). "Dr. Henry Wu Returns in Jurassic World". IGN. ^ Melrose, Kevin (October 30, 2015). "Jurassic World's BD Wong Joins Gotham As Hugo Strange". Comic Book Resources. Retrieved February 8, 2016. ^ Andrew Gans (May 21, 2012). "Herringbone, With Tony Winner BD Wong, Plays NYC May 21–22; Performances Will Be Recorded". PlayBill. 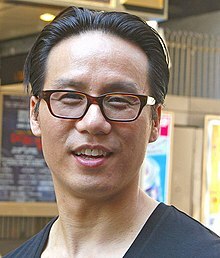 Wikimedia Commons has media related to B. D. Wong. This page was last edited on 25 April 2019, at 06:56 (UTC).